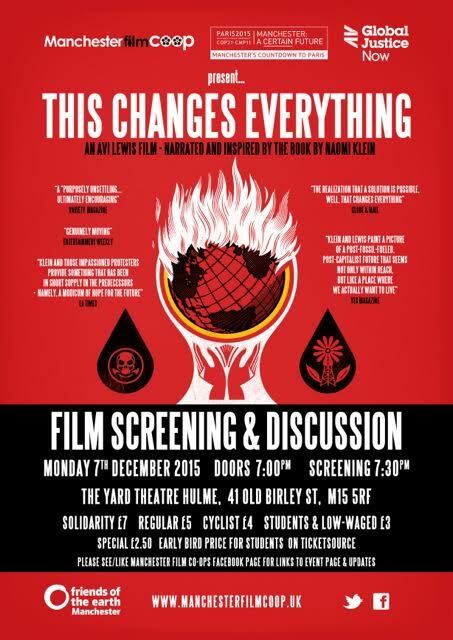 Just ahead of the culmination of the Paris COP21 conference on 11 Dec 2015 Manchester Film Co-op, in partnership with Manchester A Certain Future, Global Justice Now & Manchester Friends of the Earth, are delighted to announce our screening of This Changes Everything, the 2015 documentary conveying Naomi Klein’s positive visionary call to climate action. 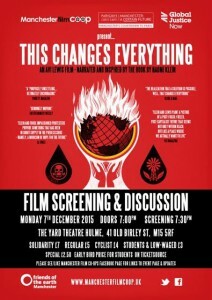 The post-screening discussion will be led by MFC’s three screening partners. It is one of a series of MACF events that have been happening in Manchester since September 2015, in the run up to and in parallel with the UN Climate Change Negotiations in Paris (November 30 to December 11). Date: Monday the 7th of December. Doors: Doors at 19:00, screening to begin at 19:30. Entry: Tickets available in advance online, or on the door. Venue: Yard Theatre, 41 Old Birley Street, Hulme, Manchester. M15 5RF.